Neuropsychiatrists at Sheppard Pratt work with patients, families, and caregivers to maximize opportunities for healing and recovery. We get to know your loved one before developing a personalized treatment plan. This plan may include psychiatric medications and therapies, such as cognitive behavioral therapy. Your loved one receives care from doctors (neuropsychiatrists) with specialized training in neurology and psychiatry. Our team also includes social workers and psychiatric nurse practitioners. We deliver effective care for mental disorders that are often caused by problems with the nervous system. This level of expertise is available in only a handful of programs nationwide. 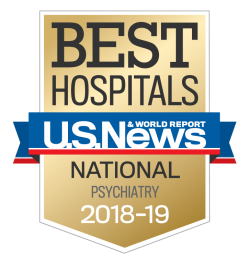 To help your loved one get the care that best meets their needs, we start the treatment process by conducting a detailed neuropsychiatric evaluation. Find out more about neuropsychiatric evaluations. We offer many of the services your loved one needs right here at Sheppard Pratt, including behavioral therapy. For patients whose needs are better served in a residential assisted living program or day program, we coordinate with local providers to offer the best possible care. Many people start feeling better with the help of psychiatric medications. Our neuropsychiatrists select the options that are most likely to work while minimizing the risk of unpleasant side effects. The right psychiatric medications depend on the symptoms your loved one is experiencing and how serious they are. Antidepressants: These medications relieve symptoms of depression and anxiety. Psychostimulants: Also known as stimulants, these medications increase activity in the brain’s frontal lobe to improve concentration. Cholinergic medications: These medications help brain cells (neurons) work more effectively to ease memory problems. Mood stabilizers: These medications make moods less extreme. For example, if you experience periods of excitability (mania), mood stabilizers may make them less severe. Antipsychotic medications: Taking antipsychotic medications can make it easier to control psychotic symptoms that often stem from extreme moods. Sleep aids: We may prescribe medications, including beta blockers, to help relieve sleep issues. With cognitive behavior therapy, we pinpoint the triggers that cause people to experience negative thoughts or emotions. We then teach methods for responding to those triggers in a more useful way. For example, for people with a history of anxiety attacks or self-harming behaviors, we teach them to identify triggers and actions they can take to change the situation. Techniques may include changing their thought pattern or relaxation techniques. We use gentle pulses of electrical energy to stimulate areas of the brain responsible for psychiatric conditions, including severe depression or mania. Learn more about electroconvulsive therapy (ECT). Our family approach includes information and support for family caregivers. We offer helpful recommendations and reassurance when you need it. Our services help you worry less about your loved one’s well-being so you can enjoy spending time together. We are bringing scientific discoveries to patients in the clinic. Learn more about research at Sheppard Pratt. We are also working to develop new treatments that will give people additional care options for complex problems. Learn more about preparing for your neuropsychiatry appointment.